Properties in Montchanin Station average 4.7 out of 5 stars. Idyllic, stone built house, sunny, south facing, charming and secluded. Property 27: Idyllic, stone built house, sunny, south facing, charming and secluded. Pleasant house in medieval village, with restaurants within walking distance! Property 34: Pleasant house in medieval village, with restaurants within walking distance! 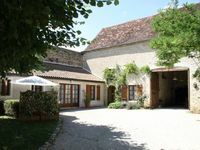 Between Tournus and Cluny, the charm of Southern Burgundy, rural cottage "ViniCella"
Property 48: Between Tournus and Cluny, the charm of Southern Burgundy, rural cottage "ViniCella"
Your stay in the heart of vineyards in Burgundy, house with swimming pool. 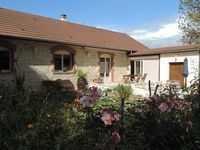 Property 50: Your stay in the heart of vineyards in Burgundy, house with swimming pool. This was a wonderful place, with plenty of room to spread out both inside and out. We really enjoyed being in a homelike environment after weeks in hotels. The property is situated close to rail tracks but we did not find that a deterrent, and rail traffic stopped in the evening anyway. Everything was clean, neat and nicely decorated and the boulangerie bakery is only a few steps away! !